I’ve been involved in the social media management of incidents many times, mostly flooding on behalf of the Environment Agency but also fires, and a major power cut too. Yesterday was my first experience from the other side, as a resident and also as one of the admins for social media accounts in my local area. The A452 Kenilworth Road is currently closed between Alder Lane and Meer End Road due to an ongoing police incident. Avoid the area. The location is about half a mile away from my house and so I retweeted the information on my own and the @balsallcom Twitter accounts. I assumed it was a traffic accident and didn’t think too much more about it, until I saw some posts in a closed Facebook group of school mums indicating it was something very different. Shortly after that there were local news reports about the situation that I shared on both Twitter and Facebook. 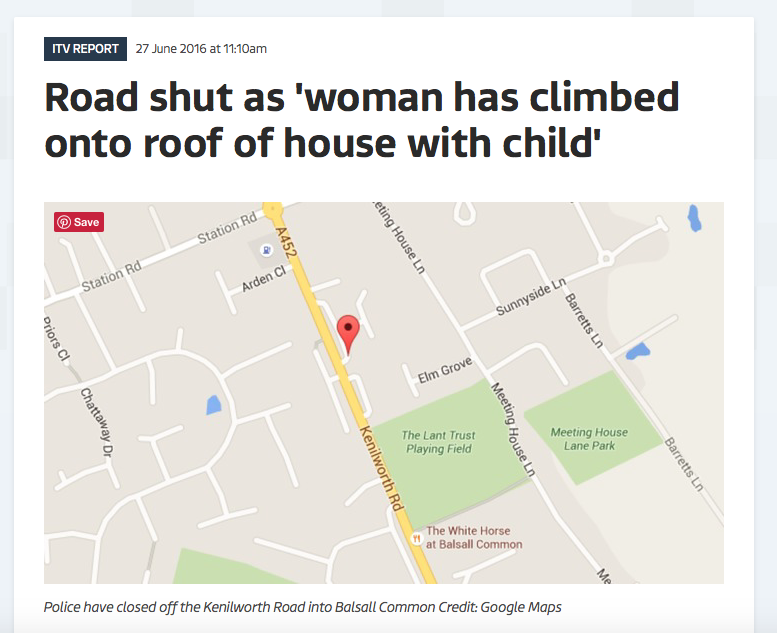 The incident was resolved around lunch time, and later in the day I was able to share confirmation that the road was open and the mother and child were no longer on the roof. They are the best way to engage with those that need to know what is happening. The road in question is a busy one in and out of Balsall Common; the social media accounts for the village reach large numbers of local people who were then able to make alternative plans for their commute, school run, and other journeys. The Facebook post alerting people to the incident reached nearly 6000 people. From Facebook insights I can see that people reached and engaged this week live largely within a few miles of Balsall Common. The Daily Mirror got the geographical information horribly wrong. But even ITV Central had the wrong location on their map. Presumably they’d googled Kenilworth Road, Balsall Common and then uploaded the result to their website. Unfortunately they did this without realising the road is a few miles long and the pin was at least half a mile out of place. The true location was off the bottom of the screen shot they’d taken – not helpful for drivers and others needing to navigate around the incident. Also worrying for people living near the pin. From a practical point of view drivers and others need to know whether the road is open or not for their journey home. There was also huge concern for the woman and her child locally. Fellow mums and other residents were anxiously waiting to find out whether the situation had been resolved. Informally some of us found out from nearby residents but it was a while before we had official confirmation from a trusted source. Thanks to West Midlands Fire Service for letting us know via Facebook. Solihull Police sent a great initial tweet alerting people to the situation with precise road closure information, but more than 24 hours later that is still the most recent tweet they’ve sent. A dramatic day and one that I hope isn’t repeated any time soon. Another local resident, summed up the thoughts of us all perfectly.